The name of Studio Ghibli co-founder, Hayao Miyazaki, is constantly brought up by comic creators when they need a shorthand for describing a specific blend of spectacle and emotion in their work, but the comparison is appropriate in the case of the new Image Comics series, Isola. 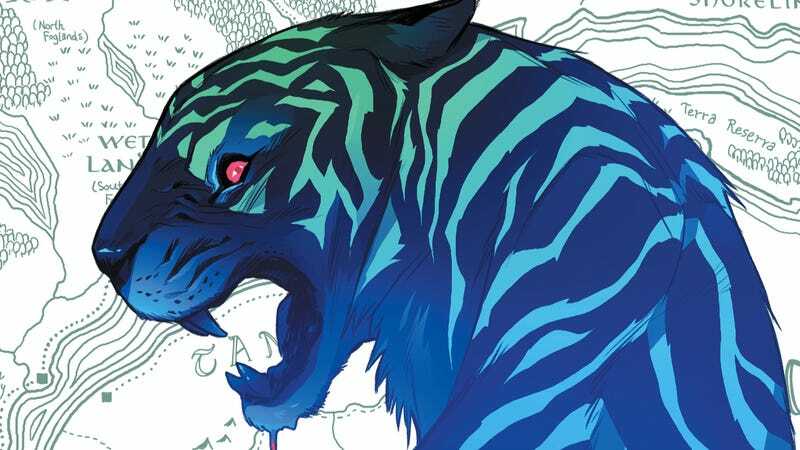 Co-written by Brenden Fletcher and Karl Kerschl with art by Kerschl and Msassyk, Isola takes readers to a lush fantasy land where a lone soldier is tasked with protecting her queen, who has been transformed into a blue tiger to escape her enemies. The series has a very different tone than Fletcher and Kerschl’s other collaborations on books like Batgirl, Gotham Academy, and Motor Crush, slowly easing readers into this environment rather taking them on an exhilarating, in-your-face thrill ride. There are certainly moments of excitement in the first two issues, but Rook and Queen Olwyn are trying to avoid conflict in order to survive. In Isola #2 (Image), the two are separated when Rook has to search for supplies in a decimated village, and the ominous two-page spread of Rook walking into the ruins emphasizes how important atmosphere is to this creative team. This book is primarily a showcase for Kerschl and Msassyk’s artwork, which is as expressive as it is detailed. The Miyazaki influence comes through most heavily in Kerschl’s animated linework and Msassyk’s textured, vibrant coloring, and even though this is a dangerous fantasy landscape, there’s a softness to the art that is very welcoming. One of the most innovative elements of the art is the sound effects, and instead of using English onomatopoeia, Kerschl and letterist Aditya Bidikar have developed a unique language and typeface that captures the feeling of the sounds rather than spelling them out. This story has a lot happening with a fallen kingdom, a royal murder, and a transformed queen, but the writers tease these larger plot points without bombarding the reader with exposition. The dialogue smoothly delivers background information, but there are gaps that come from assumed knowledge within the conversation, leaving holes to pique the reader’s interest. 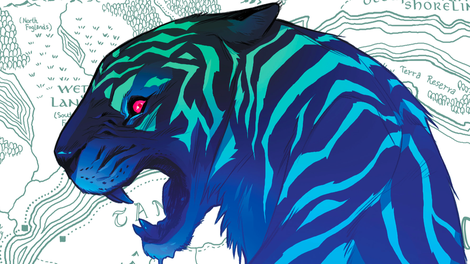 The pacing of Isola suggests that it will read best in collected editions, but there’s value in absorbing a slower story in individual chapters and letting those sink in. With a book as visually impressive as this one, it’s highly encouraged that readers go back through and take in the narrative again by looking solely at the art. There are subtle details in the visuals that inform the storytelling, like the layout for the first interaction between Rook and a mysterious wolf girl. The girl hides behind a rock when Rook makes herself known, but when she’s offered a piece of food, the girl steps out to meet this stranger. They are in separate panels at the start, and the border between them moves toward the center of the page as the girls emerges. The border disappears and they appear in the same panel when she gets close enough to reach for the food, but that separation reoccurs when the girl is frightened away by one of Rook’s old acquaintances. As majestic as Isola is, it wouldn’t be as engaging without this attention to character, and there’s a lot happening in the artwork that reinforces emotional dynamics to get readers invested in these relationships.